Uni hand knotted wool carpet col. ivory white. Uni hand knotted wool carpet col. grey. Grid hand knotted wool carpet col. white-light grey. The Woodnotes outdoor carpet has a soft feel and is transpiring therefore ideal for leisure living. Outdoor River carpet col. graphite-pearl grey. Laveri outdoor bench with drainable mattress upholstered Saimaa fabric col. natural white. The Outdoor My lounge chairs upholstered Saimaa fabric. Woodnotes outdoor carpets are suited for all moist and humid conditions and for indoor use. Outdoor River carpet col. graphite-pearl grey and Outdoor My lounge chair. The Woodnotes outdoor carpet has a soft feel and is transpiring therefore ideal for leisure living. Outdoor Pond carpet col.graphite-pearl grey. Laveri bench’s stable construction is made from larch. 4612 Roo lounge chairs upholstered with Saimaa outdoor fabric. 46700WB Siro+ bar stool, stained black oak with black painted footrest, seating height 65 cm. 4470 Siro+ bar stool, oak with brass footrest, seating height 65 cm. Stained black Twiggy oak tables, size 66,5x66,5x38,5 cm and 44x88x45,5 cm, together with San Francisco paper yarn carpet col. 1433215 nutria-stone. San Francisco nutria-stone paper yarn carpet with sewn edges and backing, size 330x450 cm. San Francisco paper yarn carpets. 115915 Cut Stripe paper yarn carpet. Photo: Janne Tuunanen. Two-toned San Francisco paper yarn carpet, 1430215 col. grey-stone. In the year 2018 the San Francisco carpet is available in five new colorways allowing even more possibilities for interior design. The new colorways are based on two-tone combinations completing the multi-colored San Francisco collection with subtle options. San Francisco 1430215 col. grey-stone. The Road paper yarn carpet’s design is based on narrow horizontal stripes which give a feeling of moving forward along a road. The carpets are two-colored with wider stripes at the ends. Road 1441501 col. stone-white. 47001C Woodnotes Bed headboard stone-white, 46700W Twiggy oak bed side table size 44x44x45,5 cm. 4400 Siro+ oak chair, 116151 Railway stone-white paper yarn carpet with narrow edging and backing, Vista 213115 chain operated roller blind. The long piles of the Wild 1640115 light grey tufted linen wool carpet allow footprints run wildly on the surface of the carpet than footprints in the snow or sand. Vista 21311 white chain operated roller blind, 4400 Siro+ chair and Railway 116151 stone-white paper yarn carpet. Personalized Path tufted wool linen carpet at the office lounge. Interior design Joanna Laajisto. Photo Mikko Ryhänen. 4489 Siro+ bar stool hight 75 cm stained black and black painted metal footrest. Photo Anna Huovinen. San Francisco paper yarn carpet col. reddish brown-stone with sewn edges and fringes. Photo Anna Huovinen. 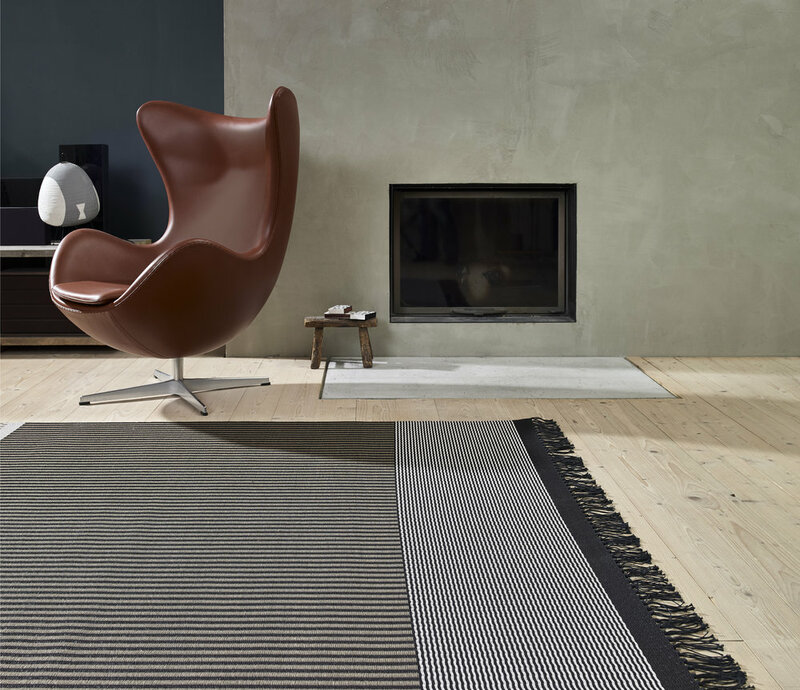 Woodnotes inspiration: Squareplay paper yarn carpets together with Big Stripe and Stripe carpets, 4400 Siro+ oak chairs, 46700W Twiggy table, Mesh hand knitted curtains. Woodnotes interior / Squareplay paper yarn combo with 1420915 Big Stripe and 1190915 Stripe paper yarns black-stone, 46003 Narrow Tubular k Chair col. graphite matt-black tubular frame, 4419 Siro+ black seat leather upholstered, 7300101 Woodwool hand knitted throw col. white and 7110902 Mesh hand knitted partition black-steel. Woodnotes 47009 Corner beds, Round bench and Square beches, 46003 Narrow k Chairs with tubular feet, 46703W Twiggy table size 44x88x45,5 cm, 1612222 Sammal col. Ice wool linen tufted carpet, 1420915 Big Stripe col. black-stone paper yarn carpet. 1433215 San Francisco nutria-stone paper yarn carpet and 21311 Vista white-stone cahin operated roller blinds. 1470915 Village black-stone paper yarn carpet and 21211 Open Sky white chain operated roller blind. O21211 Open Sky col. white roller blind and 7300101 Woodwool col. white hand knitted carpet. 1390140 Midsummer col. white-graphite paper yarn.